Del Monte Speakeasy’s Boozy Sunkist Cocktail. 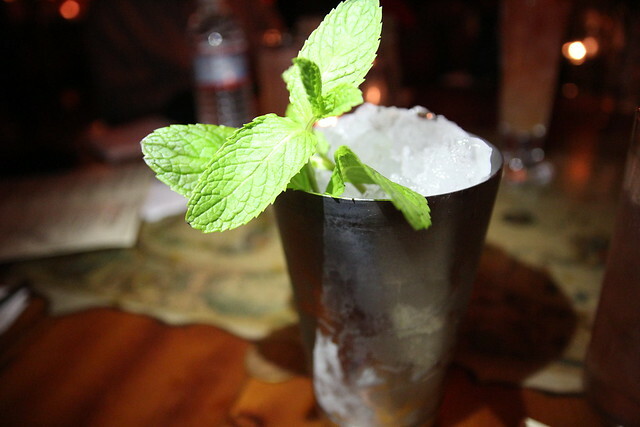 The trend in Prohibition-style cocktails in Los Angeles saw the rise of speakeasy-esque bars. 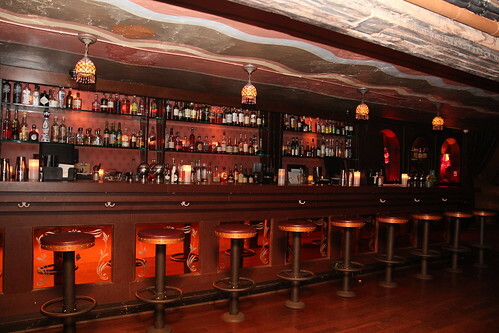 A drinker couldn’t throw a stick without hitting a “speakeasy” which usually meant a lounge-y bar with password-entry/hidden entrance and a pre-Prohibition cocktail program. See The Varnish (nondescript entrance) downtown and Seventy7 Lounge (password) in Culver City. But in Venice, seems we have a genuine speakeasy in our midst. Yup, a bar that was in operation before that dark, dry period and even during, thanks to a network of underground tunnels (purportedly one that ran all the way to King Eddy Saloon in downtown! ), mob ties (shhh) and a grocery store front. 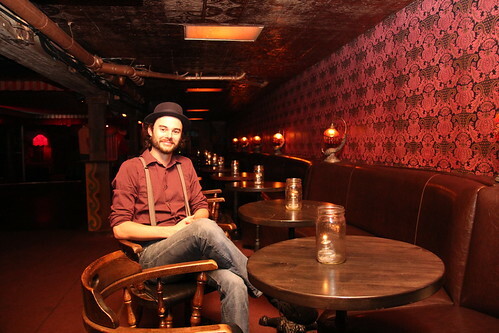 The Del Monte Speakeasy has been serving booze since 1915 and operating illegally from 1933 til just last year. Everyone from The Doors to the Red Hot Chili Peppers to Feist has performed on its stage. With new owners (only the fourth one in the bar’s long history), Louie and Netty Ryan (owners of Zanzibar, Temple Bar, Little Temple and the upcoming Virgil in Silver Lake) , Del Monte boasts a full entertainment schedule and a shiny, new cocktail program created by Brandon Ristaino, former “Bourbon Baron” of Thirsty Crow and Bigfoot Lodge West. One night before the bar’s weekly burlesque and comedy shows, I was invited — along with drinking buddies Busy Beth, EstarLA, Savory Hunter and Lindsay of LAist — to check out the new spring cocktail list. Now, just glancing at the menu, it looks like a kuh-rayzee mix of ingredients and flavors. Cinnamon-infused absinthe? Cynar and coconut syrup? It’s like everything thrown at the wall to see what sticks. The second best seat in Del Monte Speakeasy. Mixologist Brandon admittedly loves “bizarre ingredients” but at the same time wanted to keep everything “palatable to the Everyman.” But unfortunately not all the combinations worked well together with certain ingredients overwhelming others. 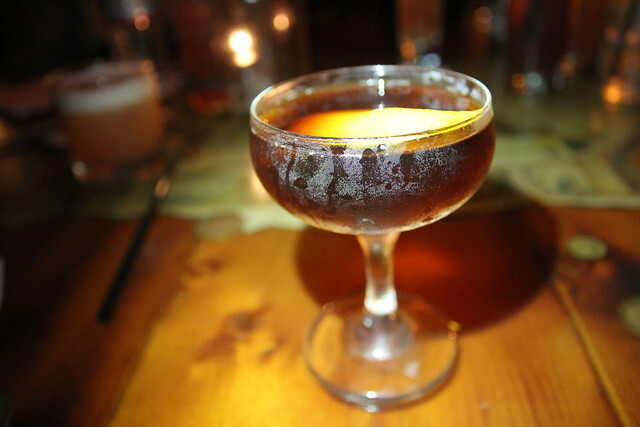 The R&R with Guyana rum, Averna Amaro, walnut and rhubarb bitters had no depth and simply tasted of walnut. The Spring Forward with cachaca, muddled strawberries, Cynar, coconut syrup, lime and sake only tasted like strawberries. However, Brandon did offer to remake the cocktail after I told him that and it came back a little better balanced. After being pleased by only a couple of cocktails (out of the nine) that I tried, I gave Brandon my tasting notes and to his credit he carefully listened. So although my round of drinks wasn’t exactly stellar, I’m hoping that he’s since fine-tuned them. Hit the jump to see my notes. So standout favorites were the PSA and the tropical Hans Brinker. These cocktails ($12 each) along with some seasonal classics, are only available in the speakeasy while upstairs at the Townhouse, which has a wall of 125 whiskies, it’s more whiskey-centric classics. By the way, the best seat in the house, which is said to be haunted by the ghost of Frank Bennett (owner from 1972-2003), is the back corner booth across from the bar. Hole up there with your pallies for the night during Jazz Flight Tuesdays — live jazz, spirit flights and themed cocktails — or Wednesdays when it’s a comedy show at 9 and burlesque with Hell’s Belles at 11pm. No cover both nights, other nights/shows it’s usually $5. Balrog: Mezcal, Cynar, housemade sour cherry syrup, orange bitters. Tastes like a campfire. 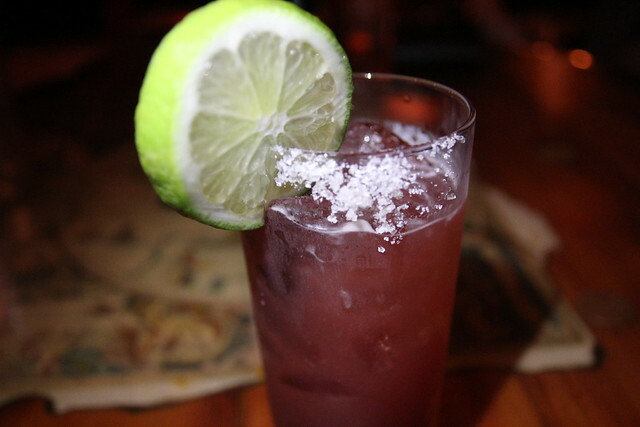 Mezcal overpowers the cocktail with its smokiness. Can’t taste the other ingredients. Blazing Saddle: too spicy to finish. Savory with its bit of salt. 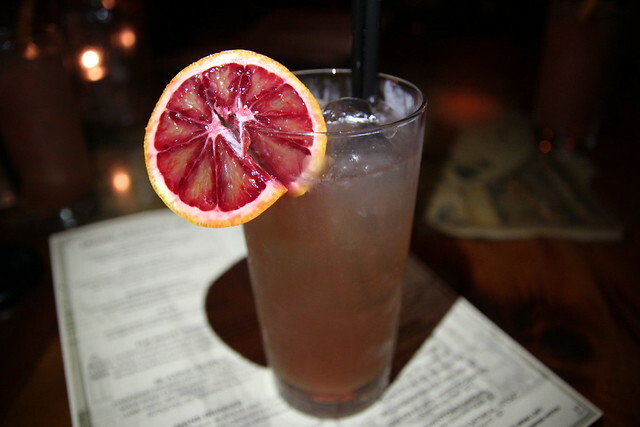 Boozy Sunkist: Blood orange-infused gin, brandy, lemon juice, house prepared demerara syrup and soda. Has the effervescence at the back of your throat. Can’t really taste the gin. Light orangey and totally reminiscent of the fizzy orange drink of my youth. Gaelic Swizzle: Irish whiskey, green Chartreuse, housemade ginger syrup, lime juice, bitters, agave nectar, soda. Very intense, in a bad way, I don’t think even I could drink the whole thing. Gingery without the heat. Irish whiskey is too light in that drink. Hans Brinker:You can actually taste the spirit in this. Hint of pineapple. You have to drink with a straw or you’re missing the flavors. Champagne brings dry effervescence. The Hapsburg: Cinnamon-infused absinthe, genever, grapefruit juice, house prepared honey syrup. You can taste the Genever. But it is weird to have the cinnamon and absinthe which cancel each other out. PSA: Pisco, Aperol, citrus, house prepared demerara syrup, egg white, Peruvian bitters. The table favorite, the only one we asked for another order of. Nice froth from egg whites. Well made and well balanced. R&R: Tastes like walnut soda with a touch of soy sauce. Spring Forward: Cachaca, muddled strawberries, Cynar, coconut syrup, lime juice, sake. Tastes only of strawberries with back end of bitter. Caroline…while I wish the part about a tunnel running all the way from Venice to DTLA was true…I doubt it is. 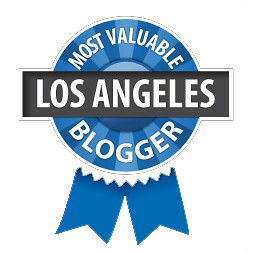 DTLA does have an extensive number of tunnels running below it, but I’ve never read anything about one extending much outside it’s limits…let alone all the way to Venice! Did you read or see this somewhere or was it just hearsay from one of the new barkeeps at Del Monte? It really make me kinda thirsty.. 🙂 It really look so great..
From research I’ve done, and stories I’ve heard from before the Del Monte Speakeasy was reopened, the tunnels under Townhouse only extended throughout the Winward Business District, to the old Abbot Kinney Pier in early 1900(got burned down in 1920). The tunnels in Venice used to be used during Prohibition to get Run and Whiskey ashore. B-Rist does it again. Brandon is a professional, a genius, and he has a cool hat. The drinks are unequivocally tasty and original. Proud..